In the Beinecke Library (GEN MSS 664 box 51, B 7273) there is an interesting undated document signed by ‘H.D. Nash’ headed ‘Stevenson’s Fables’ with a blue-pencil note at the top ‘Opinion I’ initialled CN (though the second letter is smudged and it might not be ‘N’). were it not for the information given me as to the severely (though no doubt properly) critical spirit in which the selection of his works for republication in a permanent form is being made. On the whole, though it might be too much to say these fables would “detract from his reputation”, I should be disposed myself to exclude it from a collection which is to contain only Stevenson’s best work. The Fables were first published in 1896 in an edition with Dr Jekyll and Mr Hyde and they were included in vol 22 of the Edinburgh Edition published in 1897. What is interesting about the letter are the comments about the intended ‘severely critical spirit’ of the selection of only Stevenson’s best work. It does seem at first sight to be correspondence concerning the Edinburgh Edition. Does anyone know anything about H.D. Nash? The right-hand page was probably written on Sunday 16 January between Glenluce and Wigtown in Galloway and records an overheard conversation about renouncing drink. The mark [?] in the transcription refers to an uncertain preceding word. Any help on this (or any other aspects of the transcription) would be most gratefully received. Deed, ye’ve just as much need of it as me – Miss Thamson, Miss Thamson! – Musure Macfadyen just as much need of it as me. – Deed, Weeliam I think about as much. (muckle?) Ye see, he was like you. He took it an he couldna keep it. – I kept it nine month, by God and Macfadyen kept it a a week. the players are probably RLS’s cousin, Bob Stevenson (RAS), RLS, and their friends Walter Grindlay Simpson (WGS) and his younger brother William (WS), a few months later in Barbizon (April-May 1876), when perhaps RLS was writing up his ‘winter’s walk’. 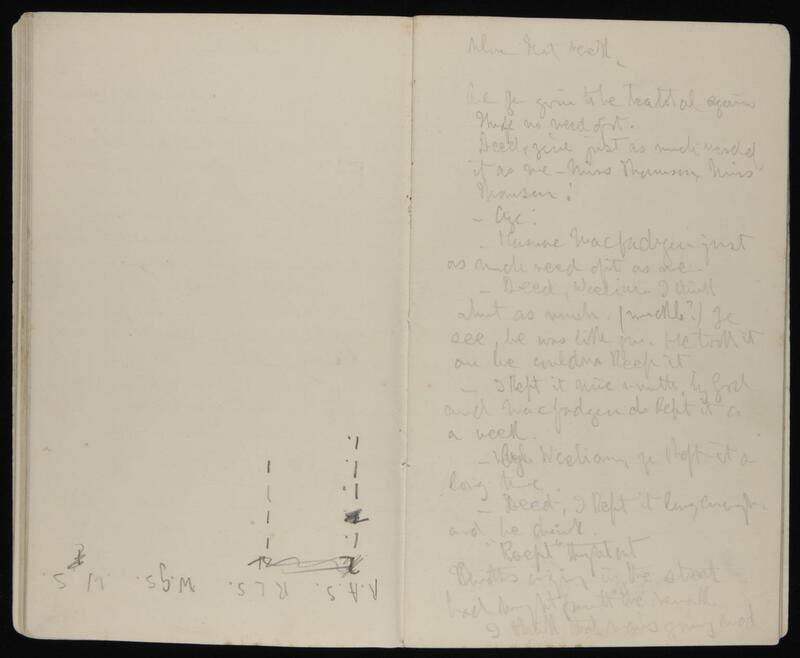 This conversation transcribed by RLS on his walk is listed by McKay as a separate work: Drinking, Going Tea Total, Etc. (6168). spelling indicates pronunciation of an Irish or Highland speaker. could be ‘Thomson’, but since RLS is interested in pronunciation here, the Scots form has been chosen. for ‘Monsieur’; if the first letter is ‘H’, ‘Husure’, it might indicate a Highland or Irish pronunciation of ‘Oh! sure’; the penultimate letter could be ‘n’. note from RLS to himself; perhaps trying to remember which word was used. ‘He took the pledge’ to renounce alcohol. RLS notes the form used in this dialogue.